Bohunt School: Are major data leaks inevitable? 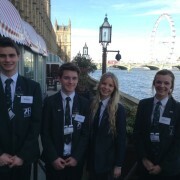 Four pupils from Bohunt School went up to the House of Lords on the 17th March for the All Party Parliamentary Engineering Group debate and had an extremely fascinating day. All being interested in different areas of science, we found it very useful to not only meet brilliant engineers but also listen to a very relevant debate about internet fraud and technical computer security issues. We were also able to contribute with our own questions which were of particular interest to us . We felt very grateful and privileged to be invited up to London and dine with the best view in London.